Do you dream of uninterrupted panoramic sea views coupled with multi-million dollar yachts in the perfect mountain backdrop? 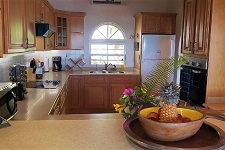 A dream becomes reality at this three-bedroom ultra-chic private villa, majestically crowning Sleeping Indian Hills, while overlooking Jolly Harbour on Antigua’s glorious west coast and nearby islands, with the perfect balance of extravagance and comfort. Upon entry, your eyes will be drawn to the turquoise, iridescent sea water and large, pristine swimming pool through the glass living room doors. AntiguaBella features upscale, elegant furnishings with seamless indoor/outdoor living. The refined architecture is sleek, stunning and the clean-lined, upscale fusion of British Colonial Caribbean and modern furnishings keeps the focus of the picturesque sea views. Tuxedo style sofa, plantation chairs, low accent tables and polished floors are understated yet inviting in the living room, while the dining room adds a bit of glam with a rustic yet sophisticated wood scrapped extendable dining table, with expertly carved legs. The high, vaulted plank ceilings and wood carved ceiling fans throughout the villa are crafted with fine detail. Plus, for added comfort, each room has individual climate control AC, however it’s rarely needed due to the trade winds. The three exquisite, spacious bedrooms can accommodate up to seven guests at this non-smoking home. 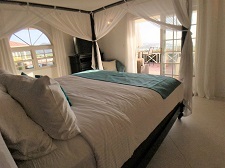 The en-suite master bedroom features an imported, king canopy bed with pineapple carvings and walks out to its own private, covered terrace with sitting area overlooking the sea. The architectural detail will make you want to linger in this private oasis, reminding you you’re in tropical bliss. From the terrace, a short path leads you to a fruit garden. Indulge in fruits such as mangoes, bananas, papayas, guava, limes, and soursop to name a few. Whether you’re seeking a vacation for family, friends or a special place to hold an event, AntiguaBella provides the perfect venue, offering luxury accommodation in a truly striking setting. The vacation of a lifetime awaits you at AntiguaBella! Make your dream vacation a reality by clicking here for special rates.